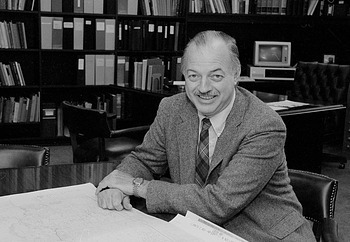 Robert McCormick Adams, an archaeologist and anthropologist, served as the Smithsonian’s ninth Secretary from 1984-1994, Prior to his work as Secretary, he was director of the Oriental Institute at the University of Chicago in 1962-68 and 1981-83. Born in Chicago in 1926, Adams earned his doctorate from the University of Chicago in 1957. He stayed on to teach at the university and in 1982 was named provost. Adams’ scholarly work focused principally on the agricultural and urban history of the Near and Middle East, and the geographical and archaeological study of settlement patterns. Adams was installed as Smithsonian Secretary on September 17, 1984, becoming the head of an Institution with thirteen museums, a National Zoo, and scientific and cultural research facilities in nine states and the Republic of Panama. As the successor to the dynamic S. Dillon Ripley, Adams sought to prepare the Institution for the 21st century, focus on scholarship, increase public programs, and emphasize a broader representation and involvement of diverse ethnic and cultural communities in the Smithsonian and its programs. Adams oversaw construction of the Quadrangle, a building project that brought together two museums and many disparate offices into a single structure, but he also sounded the alarm to the US Congress about the state of the Institution's aging infrastructure and began the systematic renovation of existing facilities. These “bricks and mortar” projects included renovation of the Freer Gallery, the construction of the Mathias Laboratory at the Smithsonian Environmental Research Center, and the Earl S. Tupper Research and Conference Center at the Smithsonian Tropical Research Institute in Panama. During Adams’ tenure, the Smithsonian acquired the National Museum of the American Indian, and the National Postal Museum was established to showcase the National Philatelic Collection. The National Science Resources Center was created to improve the teaching of pre-college science and mathematics, and the International Center was established to explore ancient and evolving cultures and to serve as the Smithsonian's headquarters for Latin American scholarship, exhibitions, and programs. Adams formed the Smithsonian Cultural Education Committee to promote diversity across all aspects of Smithsonian operations. He also encouraged digitization projects, such as the National Air and Space Museum’s videodisc technology for storage and retrieval of documents, photos, and other information. The “culture wars” arrived at the Smithsonian in 1991, with criticisms of The West as America, an exhibit at the Smithsonian American Art Museum. In 1994, Science in American Life, at the National Museum of American History, provoked outcries from the scientific community for its critical look at American science. And the first script for the Enola Gay exhibit in the National Air and Space Museum was completed shortly before Adams' departure, with storm clouds gathering on the horizon. In his pursuit to increase critical scholarship and have exhibits reflect that change, Adams incurred opposition from a variety of groups. Adams retired from the Smithsonian after ten years of service in 1994 and returned to academia as an adjunct professor at the University of California, San Diego. He received a Distinguished Service Award from the Society for American Archaeology in 1996 and has continued his fieldwork and research in the archaeology and anthropology of the Middle East. Adams arrived at the Institution after two decades of rapid growth, and he successfully consolidated the projects set in motion in the decades prior to his arrival. He also laid the foundations for the National Museum of the American Indian and National Postal Museum and worked to increase the diversity of the Institution.